Beaverton, OR – June 12, 2018 - RIGOL Technologies announces a significant addition to its oscilloscope portfolio with the introduction of the New 7000 Series Digital Oscilloscope. "We believe the 7000 Series is simply the most powerful and affordable mid-range oscilloscope in the market,” continues Michael Rizzo. 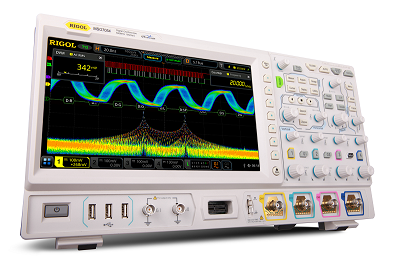 “With category leading performance, robust analysis tools, and a next gen UI, delivered at a starting price of only $2699, we encourage customers considering the MDO3000 from Tektronix or the DSOX3000T from Keysight to compare the performance, features and overall value of the RIGOL 7000 Series Oscilloscope." The 7000 Series is available and shipping now. There are 8 Models (100MHz, 200MHz, 350MHz, and 500Mhz) with or without the Logic Analyzer (MSO). Pricing Starts at just $2699. Learn more about the RIGOL 7000 Series Digital Oscilloscope at WWW.RIGOLna.com.